2012 – 6 Best Gadgets that Defined CES | Cheaper tablets, thinner laptops and an array of sleeker TVs stood out at this year’s International Consumer Electronics Show in Las Vegas. More than 140,000 people gathered there this week, for an event that’s growing despite the absence of Apple and more recently, the decision by Microsoft to make this the last year it participates. The industry’s enthusiasm for tablets was considerably tempered this year compared to last, when more than a hundred manufacturers thought they could capitalize on the iPad’s success with their own models based on Google Inc.’ Android software. Sales were disappointing, in large part because Apple prices the iPadrelatively low compared to the cost of making it. Then, late last year, Amazon.com Inc. demonstrated that you can take on Apple by selling a smaller, barebones tablet for $199. Analysts believe Amazon sold millions of Kindle Fires in little more than a month. Now, Asian manufacturers are hoping to jump on Amazon’s bandwagon. One of those companies, Taiwan’s AsusTek Computer Inc., showed off a tablet with a Fire-sized screen and said it would sell it for $249. It’s considerably more powerful than the Fire, sporting a premium “quadcore” processor. Still, one of the things that made the Fire a success — Amazon’s library of e-books, music and movies — will be missing. In recent years, the world’s largest phone maker, Finland’s Nokia Corp., has practically been a no-show in the U.S. market. That’s hurt the company badly. Now, it hopes to come back with smartphones that run Microsoft Corp.’s Windows Phone software. The Lumia 900 is its first such phone for the AT&T network, and the first Nokia phone to use AT&T’s faster wireless “LTE” network. In a sign of how much is riding on these phones, both the Microsoft and Nokia CEOs showed up for Monday’s announcement. The companies didn’t announce price or availability. T-Mobile USA, a smaller carrier, started selling a more modest Lumia this week. While Nokia’s been shut out of the U.S. phone market, Intel Corp., the world’s largest chipmaker, has been shut out of phones entirely. Its PC chips use too much power to go into a smartphone: they’d drain the battery in no time. That’s a big problem for the company, since PC sales are flat in the developed world, while smartphone sales are exploding. Now, Intel says a new line of chips is ready for smartphone use, and Lenovo Corp. of China is the first to take them up on it, with a smartphone to be sold in China in the second quarter. Outwardly, it’s indistinguishable from any other touchscreen phone, and it runs Android. Motorola Mobility, the phone maker that’s being bought by Google, also committed to making phones and other devices with Intel chips. Without offering many details, the company said the new devices will be on the market in the second half of the year. Both LG and Samsung showed off 55-inch TVs with screens made from organic light-emitting diodes rather than the standard liquid crystals or plasma cells, and said they’ll on sale this year. They didn’t say what they would cost, but analysts expect the price to be upwards of $5,000. The sets are long-awaited. OLED TVs have been on the horizon for some time, but they’re difficult to manufacture in large sizes. They provide a high-contrast picture with highly saturated colors. They can also be very thin: LG’s set is just 4 millimeters thick, or one-sixth of an inch. Intel created the “ultrabook” as a marketing term for thin, light and powerful laptop computers. They’re essentially the Windows versions of Apple’s MacBook Air. PC makers have embraced the term enthusiastically. 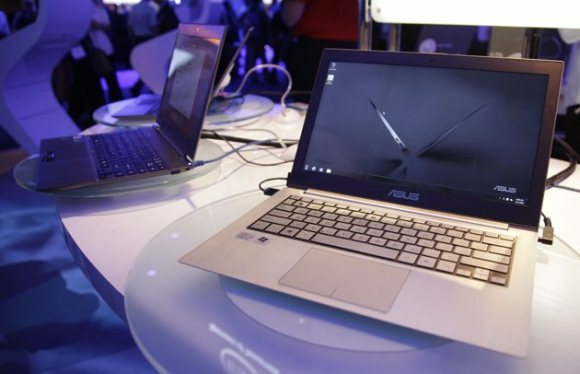 As a result, there were scores of ultrabook models on display at the show. Two that stood out were the Lenovo Yoga, which has a touch-sensitive screen that bends backward to fold over completely, turning the device into a large tablet. It will launch with the new Windows 8 operating system later this year. The HP Envy 14 is a more conventional luxury model, and goes on sale Feb. 8, but has two details that set it apart: a sensor for Near-Field Communications Chips (which means you can transfer information from a similarly equipped phone by tapping it to the PC) and an audio chip that can communicate with some headphones to provide much better audio quality than Bluetooth. The Envy 14 will cost $1,400. Bob O’Donnell, an analyst with research firm IDC, believes ultrabooks are “not a fad.” ”We absolutely see ultrabooks as being the future of notebooks,” he said. However, O’Donnell thinks ultrabooks will really take off once they are priced at about $800, closer to the price of regular laptops. The Japanese camera maker revealed a compact camera that pushes into professional camera territory. Its G line of relatively large compact cameras has been popular among enthusiasts, and the G1 X extends the range by including an image sensor that’s more than six times larger than other models in the range. Sensor size is the most important factor for a camera’s image quality, far more than the number of megapixels — 14, for the G1 X. It’s the first camera to use a sensor of this type, which is only 20 percent smaller than the “APS-C” sensors used in single-lens reflex cameras, or SLRs (though some luxury compacts from other manufacturers use APS-C sensors). The G1 X will have a 4x zoom lens that retracts into the metal body, and will sell for $800. Prev PostHow Python Exotic Leather Handbags Made?